Tell me a little about yourself and why you became a celebrant. Kirk – When I was 22 years old I packed my bags and headed for Melbourne to pursue a career in the arts. Arriving in Melbourne I chose not to confine myself to a 9-5 office job wanting flexibility and a chance to enjoy the new city so looked at the possibility of setting up my own business. It was my sister who actually recommended that I become a marriage celebrant. She said then one day you can marry me like how Joey married Monica and Chandler on Friends…! I attended and completed my training and by the age of 23 was a registered and authorised Commonwealth Marriage Celebrant. 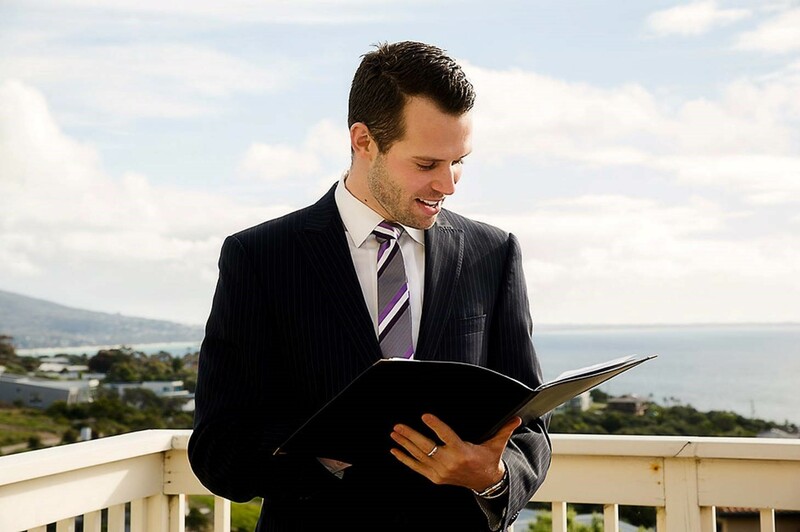 Kirk – As a marriage celebrant my role has two main components – firstly to complete the necessary legal paperwork and requirements for marriage in Australia with each couple and secondly, help them to create and write a unique, personal and memorable wedding ceremony which I will present on their wedding day. Being a wedding celebrant really is one of the best jobs in the world! It is my privilege and honour to be part of people’s big day and perform such a significant and memorable role. Thinking about that first appointment, how can a couple be best prepared? Kirk – Meeting a celebrant can be a daunting experience for many couples who have never been married before so have no idea what to expect from a celebrant or how to plan a wedding ceremony. You can go in equipped with a list of questions for the celebrant, however, the right celebrant should be able to take you through the whole process and answer all your questions before you have even asked them. The most important factor to this first meeting is the connection and rapport you build with that celebrant. How does that celebrant make you feel? The right celebrant will make you feel relaxed and comfortable, as well as confident that you not only understand their role in your wedding but that the celebrant understands what type of ceremony you are looking for. How far before a wedding should a couple book their celebrant? Kirk – As far in advance as possible! I say that because once a celebrant gets booked for a specific date and time, we are locked in! We can only ever be at one place at one time! Many celebrants get booked even years in advance. Saturdays around the 3-4pm time are extremely popular especially in November and March, the two busiest months of the year for weddings. If your wedding day and time is not on a Saturday or during a quieter time of the year, you’ll have a greater chance that your preferred celebrant is available. Would you recommend that a couple should meet more than one celebrant? Kirk – Yes and no. We all live in a busy world and brides are even busier! So if you meet with a celebrant, you like them and have a great connection, well why waste time meeting another one? But saying that I have absolutely no problem with couples meeting a few celebrants for it’s an incredible personal decision and every celebrant is different. My advice would be, there is no problem seeing a few celebrants for comparison but don’t feel you have to. What should a couple consider when searching for their celebrant? Kirk – Whether your ceremony is outside or inside, big or small, long or short, traditional or modern, your celebrant will set the tone and mood of not only your ceremony but your whole day. The ceremony is usually the beginning of the wedding day for your guests so from that first moment when the celebrant gets everyone’s attention, they are creating the atmosphere. From the way your celebrant talks, interacts, presents themselves and makes you feel, all these factors need to be considered when finding a celebrant. When you find the right celebrant, you’ll know because you’ll feel like you’ve found a friend. Some couples prefer a male celebrant over a female, some young than older; personally I don’t think demographics are relevant. It’s all about the individual rapport and connection. How many meetings are usually required prior to the wedding day? Kirk – Every celebrant has their own process for ceremony planning; however, I provide my couples with a wedding ceremony info pack at the first meeting which equips them with everything they need to do and lots of information and inspiration. Included are some questionnaires which they need to complete and return to me. When they return the forms, I will write their ceremony based off their answers and decisions. Then I send them the full ceremony for them to review and provide feedback. At our final meeting we will confirm everything in the ceremony and finalise all details. So we always meet at least twice, sometimes three times; however, I have an open door policy and the couple are welcome to contact me any time via phone and email, and if they feel they need further help, I would never say no to meeting with a couple. How much involvement should a couple have in the writing of the ceremony? Kirk – A couple should have complete choice in their ceremony. They should be able to choose everything – from music to readings, vows, rituals etc. I encourage my couples to write their own vows but if the couple prefer to say a standard vow, then that’s fine too. Usually I do most of the ‘writing’ of the ceremony but everything I write is based on what the couple have either told me about themselves or they have chosen. Do you think a ceremony rehearsal is necessary? Kirk – Many celebrants do rehearsals and many don’t. I usually don’t have a ‘formal’ onsite rehearsal as such with my couples. I always meet my couples the week before the wedding to confirm all the details and cover some final legal requirements. Civil wedding ceremonies are usually simpler than religious wedding ceremonies which typically insist on a rehearsal. If a bride prefers on a rehearsal, I will happily accommodate but I personally think most brides feel relieved when I tell them that we don’t have to do a rehearsal. Usually it’s very hard logistically organising a time when all their bridal party are free to attend a rehearsal. I tell my couples that as long as you are comfortable with where the bride will enter from and where you are going to stand during the ceremony, I will take care of everything else on the day. Also, if the ceremony is at a venue with a wedding coordinator usually they will run through the ceremony set-up with you when you have your meetings with them at the venue. I arrive 45 minutes before the ceremony which gives me plenty of time to chat and confirm details with the groom, musicians, photographer, venue manager etc. What are the key ingredients to a meaningful ceremony? Kirk – It has to be about the couple! There is nothing worse than a ceremony that is just ‘fluff’… A ceremony filled with all this cheesy, impersonal stuff about love, marriage, commitment etc. I mean of course there has to be some of that stuff – it is a wedding ceremony! But ceremonies should be about the couple and their journey – how they met? How they got engaged? Travel stories… How they feel about each other? What annoys them about each other? (This usually generates a lot of laughter on the day!) A ceremony also needs to reflect a couple’s personality. A serious and traditional ceremony just doesn’t work for a really easy-going and light-hearted couple. Therefore, it is important that the celebrant takes the time to learn about the couple but also that the couple open up to the celebrant so both parties understand each other. What advice do you have for couples to ensure they experience a wonderful wedding ceremony? Kirk – My first piece of advice for any couples who are getting married outside is that you must not only have a back-up option but have a back-up option that you are happy with. If you have a back-up option that you really like then you won’t stress as much about using it nor be as disappointed if you actually have to use it on the day. The second and greatest piece of advice is try your hardest to keep perspective throughout the process and especially on the day. We all want the perfect wedding day. We don’t want anything to go wrong. But remember a wedding is one day; a marriage is a lifetime. We have weddings because we want that lifelong commitment. Be grateful that you have found the person you want to spend the rest of your life with. The happiest of brides I’ve encountered are ones that adopt a ‘what will be, will be’ approach. Be as organised and prepared as you can leading up to the day and then just go with whatever happens on the day. Any special advice on dealing with wedding-day nerves? Kirk – Just the simple things …make sure you eat, drink water, and don’t drink too much alcohol before the ceremony. Sure have a glass of bubbly as you are getting ready but there is plenty of time for drinking at the reception! Also, try to minimise stress on the actual day. Get everything organised and dropped off beforehand so that on the day all you have to do is get ready. The most relaxed couples are ones who have usually had plenty of time to get ready, maybe had breakfast with their bridal party in a hotel, went out for coffee etc. – something relaxing before the big afternoon and night ahead! What should a couple expect to pay for the services of a celebrant? Kirk – A celebrant’s fee is a hotly debated topic amongst brides and celebrants! To get married at the WA Registry Office costs approximately $400. No celebrant should charge under $400. Anything less is undervaluing the celebrancy profession. I would say the average price for a celebrant is around $600 (which in all honestly, is too low considering the significant role that your celebrant plays in your wedding). The higher end of the market is around $800-$1000. Some celebrants have set rates and some have different rates depending on the day and time of the week. I offer slightly less for a weekday wedding; however, some celebrants see it as the same level of work (which in reality it is) so charge the same price. Like anything you get what you pay for! My advice here is when looking at your celebrant’s fee; consider how much you are spending on other parts of your wedding. Some brides won’t blink an eye at spending thousands for flowers but want a celebrant for $500. Finally many celebrants become ‘friends of the family’… I have had some families where I have done weddings, funerals, renewal of vows and baby naming’s all for the one family. So the right celebrant is a good lifelong investment!! Any other tips or info that you would like to pass onto our brides? make you feel incredibly excited to get married!!!! To read more about Kirk and his services, please click HERE. Previous PostYour Wedding Coach – 9 reasons to love this!